There is no separate doctrine of eternal security in the Holy Bible. The gift of eternal life, by faith alone in the Good News of Jesus Christ crucified, buried and risen, IS ETERNAL SECURITY!!! They are one and the same. Once saved, always saved. Getting saved is a “free gift” (Romans 5:15). Anyone who believes God's record in the Holy Bible, that Jesus is the Christ Who died on the cross for our sins, was buried, and bodily resurrected after three days, is saved (1st Corinthians 15:1-6). God promised “TO SAVE THEM THAT BELIEVE” (1st Corinthians 1:21). We are not saved by our own self-righteousness, but by God's imputed righteousness, through faith in Jesus Christ (Romans 10:3-4; Philippians 3:9). So, a Christian can gamble, commit fornication, steal, curse in the Lord's name and do really bad things, and still go to Heaven. The people who have a big problem with that kind of thinking are NOT saved. We are saved by what Jesus did on the cross, becoming the sacrifice for our sins. Jesus died as the sacrificial Lamb of God (John 1:29). He raised up the third day as our heavenly High Priest (Romans 8:34; Hebrews 4:14-15). “'You can't tell me you can trust Christ as Savior, and then go out here and live like the Devil, and still go to Heaven!' Yes, I can tell you that! That's what the Bible says. If you don't come to the conclusion, that—Yes, you can trust Christ as your Savior and live like the Devil, and still go to Heaven when you die—you don't get grace, because that is the exact truth! That is the truth! I do not have to change my life! I don't have to stop one sin! You say, 'I've never heard a preacher say that.' You just heard one! And you listen to me—I want to live as holy and as godly as I possibly can. I am now 70 years old. I've been saved for 52 years. ... the only reason I'm going to Heaven is because, 52 years ago in a little living room, I accepted Christ as my Savior.” —Pastor Ralph Yankee Arnold, a great quote from the awesome sermon, “Calvinism And Grace Are NOT Compatible” | MP3. Now, no believer has God's approval to live in sin (Romans 3:31). God chastises disobedient children (Hebrews 12:6-8). A believer who lives in sin will be judged at the Judgment Seat of Christ (2nd Corinthians 5:9-11). But the gift of eternal life has nothing to do with the manner in which we choose to live here on earth. You never have to be re-saved, it is not possible. Just as the physical birth is irreversible, so also is the second spiritual birth by the Holy Spirit of God irreversible. Salvation CANNOT be lost. So there is no separate doctrine of eternal security in the Bible. Once you have eternal life, it is everlasting life, which cannot end. Everlasting life is life that lasts forever. So how could you ever lose it? God would be a liar if He took everlasting life back. There is not one single verse in the entire Holy Bible which says eternal life can ever be forfeited once you have it. It is “eternal” life. This means when we die, leaving this earthly tabernacle (the body), there can be no break in conscience. How could there be if we truly have “eternal” life? You see, the human body is merely tabernacle, a temporary tent for our spirit and soul. I believe our soul and spirit will be identical in Heaven (or Hell for the unsaved) as it is in our earthly body. Leaving this body doesn't change who we are. The Bible promises a new glorified body like unto the Lord's body (Philippians 3:21). The unsaved will also receive a new indestructible body, but it will not be like unto the Lord's body. It will merely be equipped to suffer the intense torment, flames and suffering of Hell for all eternity. And remember, God NEVER sent anyone to Hell, they chose to go there by their own rejection of the gift of God, which is eternal life through faith alone in the Lamb of God (Romans 6:23). The choice is yours! Islam comes immediately to my mind. There are about one-and-a-half billion Muslims in the world, who are infamous for long chant-like prayers, who all deny that Jesus is the Christ. The Bible calls them antichrists (1st John 2:22). None of them are going to Heaven. They are all going to Hell to burn forever. They are heathens. There are also many “heathens” in America's psuedo-Christian churches. Church of Christ add water baptism to the Gospel. They are not saved. Lutherans also add water baptism to the Gospel. Martin Luther himself mandated water baptism for salvation, which you can verify in his catechisms written in 1529. Mr. Luther taught the satanic lie of sacramental salvation. Consequently, Martin Luther was a fraud, not really justified by faith alone, because he didn't have faith alone, as commonly wrongly assumed. Mr. Luther is burning in Hell forever!!! How about you my friend? Have you been born-again? Religion is the worst thing that ever happened to this world. Religion wants to fit us with glasses, but the Lord wants to open our eyes! Religion, religion and more religion, that's the way of the heathen world, but only through faith in the Gospel of the Lord Jesus Christ can anyone ever go to Heaven!!!!!!! 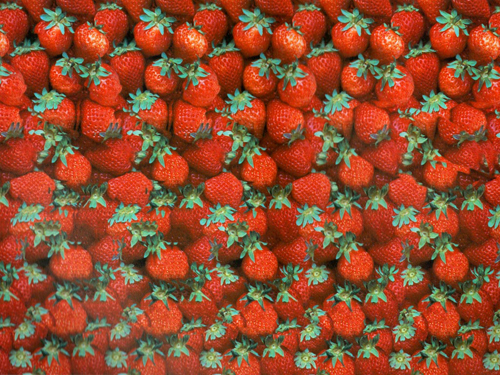 Consider the image above with the hidden 3D strawberries. This is just like religion today. The Gospel is hidden in many churches, such as the Baptist religion, but few people ever see that Gospel. You can attend Baptist churches your entire life and still go straight to Hell when you die. You can read dozens of different popular religious tracts in Baptist churches, but still never see a clear presentation of the truth of the Gospel. You can sit through hundreds of services, and still never hear a clear presentation of the Gospel. Why is this? It is because Satan is a master deceiver, who knows the best way to blind and deceive people is to confuse them, and the best way to do that is with dozens of Bible versions and to embellish the Gospel in any way possible. All this junk theology nowadays is hindering people from being saved. For example: A popular saying is to “trust Jesus,” but that is not the Gospel. The cross must be included in the plan of salvation. What about Christ's resurrection? I'm shocked how many religious tracts don't even mention the resurrection of Jesus Christ from the dead. Most churches tell lost people to “pray” a sinner's pray to be saved, but no where in the Bible is anyone required to pray to be saved. The word “call” in Romans 10:13 doesn't mean audible prayer, it means to rely upon the Lord in faith to be saved. I've met people who thought they were saved, because they prayed a prayer years ago. That is not the Gospel. We are saved by believing the Gospel, the Good News of Christ crucified, buried and risen the third day. I know Bob Jones University graduates who are unsaved, because they think more is required than merely trusting the Gospel of the Lord Jesus Christ to be saved. They think that repentance means turning away from the desire to wilfully sin. They think some attempt to depart from a deliberate lifestyle of sin is necessary to be saved. This is the garbage Calvinist theology of Pastor Charles Lawson of the Temple Baptist Church in Knoxville, Tennessee. I am not trying to be unkind, but the Gospel is important. Someone needs to refute Galatianism (i.e., partial faith in Christ plus works to be saved). The Galatians added circumcision to faith (Galatians 3:1-4), Pastor Lawson is adding holy living (turning from sins) to faith. These are the works of the Law. Turning from sins is a matter of discipleship, not salvation (Romans 12:1). For eternal life to truly remain a “free gift” (Romans 5:15), nothing can be required in return. You cannot show me anything in the Bible about “turning from sins” to be saved. The heretical concept of turning from sins was born in the theology of Cain, who tried to please God in the flesh by works.